BELIZE CITY, Thurs. 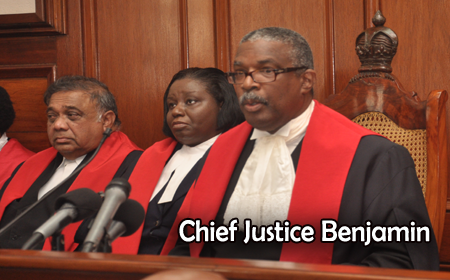 Oct. 19, 2017–Two Thursdays ago, in answer to a reporter’s question about the backlog of cases for which the Bar Association of Belize had taken Chief Justice Kenneth Benjamin to task, Prime Minister Dean Barrow had said that government was in the process of hiring two retired judges from the Caribbean to assist the Chief Justice in writing his outstanding judgments. An impeccable source from the judiciary told Amandala last Thursday, however, that Prime Minister Barrow, an attorney himself, may have misspoken, because there are no plans to hire two retired judges to assist the Chief Justice with the writing of his outstanding judgments. As it presently stands, the Supreme Court has a serious backlog of criminal cases and recently, Justice John “Troadio” Gonzalez retired from the Criminal Division of the court.